Convenience Store Shelves. 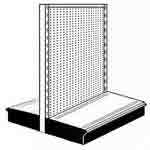 New & Used Gondola Retail Display Shelving. Convenience store shelving helps small store owners compete with larger stores by making the ordinary look extraordinary. With a new layout, and new shelves in their convenience stores, small retail merchants can stock additional items for the Christmas Season and increase their sales. Something as simple as placing end caps on the end of aisles, or adjusting shelves for more convenient display of large items with better illumination, can make the difference between selling or not selling. When people walk into a convenience store expecting to see the same old thing they always do, they will be pleasantly surprised to see a professionally merchandised layout that looks like shelving in larger retail establishments and competitively markets a blend of products that represents a steady revenue stream. There are types of convenience store shelves: double-sided aisle shelves and single-sided shelves, also known as wall shelves. Both aisle and wall displays feature shelves that can be adjusted both for height and for depth. This allows larger than normal items to be stocked conveniently, and it allows for shelving that is obscured in shadows to get better light. Before investing in aisle shelving and wall shelving, convenience store owners should develop some sort of space management plan. Since most convenience stores are small, there is probably very little room along walls for new shelves. However, custom wall units can be installed to fill in gaps and make unused corners into displays, and wall shelving can also be used to create end caps on convenience store aisles that will bring food items, small gifts, and basic supplies to the forefront of shoppers’ attention. When it comes to loss prevention, it is advisable to limit the height of convenience store shelving to allow clerks to watch customers at all times. Some retail establishments have shelving as high as 84”, but because convenience stores are smaller, we recommend using shelving that is no more than 72” in height. This still leaves plenty of stock room to merchandise all sorts of products, and it allows mirrors, cameras, and employees to monitor the floor space. 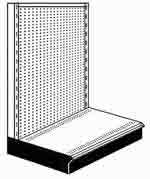 More can be done with less when it comes to convenience store shelving units by Easy Rack. It is not so much the number of physical units but how the individual shelves are adjusted on these units. The depth of an individual shelf can be as high as 22”, or as little as 12”. The significance of this becomes readily apparent to anyone who has ever had to strain to see labels on the bottom shelf. If top shelves and bottom shelves are the same depth, the top shelves block the light. In a convenience store, every bit of shelf space is essential, so gradually reducing shelf depth from top to bottom allows for an even wash of light over all the products on display. As far as decorative appeal goes, convenience store shelving is as varied as convenience stores themselves. Easy Rack has all sorts of colors to choose from, including gray, almond, black, caramel, light beige, and beige. The most popular color is almond, but this is solely a matter of subjective preference.